Mention a blog to some people, and they immediately say, “Why do I need to know what someone ate for lunch or what they think about the TV show, Mad Men?” Many people consider blogs to be only commentary or opinion, not research or hard news. Not true. Here’s my definition of a blog: a categorical, chronological publishing system. You can publish anything using the blog format, from experimental fiction to breaking news. ScienceNews publishes scientific articles every day. You can browse them by category or by date. A blog is a form of architecture, not a style of content. Blogs first became popular as diaries. The word “blog” is short for “Web log”: a date-ordered series of entries on the Web. Lots of first-generation blogs on sites such as LiveJournal were diaries, with people commenting on their lives on a day-to-day basis. Today, many of the most popular blogs are written by teams, not individuals. Boing Boing, TechCrunch, Gawker, and The Huffington Post are examples of popular blogs written by multiple individuals. Even individual posts can have many contributors. At SixEstate, every blog post is written by a team, not just one person. Each post is worked on by a writer, an editor, and an SEO specialist. There is no reason a blog has to be a solo effort. Many people refer to blogs as “interactive media.” They believe that, in order to be a “real blog,” you must have comments. Some would say if you don’t have comments, you’re hiding something, or you are missing the point of blogging. Not true. One of the best blogs on the Internet, Seth Godin’s blog, called Seth’s Blog, does not allow comments. Is Seth’s Blog stale because it has no comments? Quite the contrary. It’s actually #4 on the AdAge Power 150. What makes Seth’s Blog so popular is that it delivers quality content, day in and day out. Godin delivers long, detailed posts with breaking, original news and research, side-by-side with short, insightful commentary that really makes you think. The comment streams at many blogs have become forums for self-promotion. People seem more concerned about getting their name or company name or product name into a blog, with a link back to one of their own sites, than about adding anything to the story. The ability to comment on blogs does make them unique in journalism. It’s nice for readers to be able to instantly respond to stories. But it isn’t a requirement of blogging, and it doesn’t necessarily make a blog better. Blogs that display a strong bias often gain readership and notoriety quickly. Two of the earliest political blogs, Daily Kos and The Drudge Report, gained huge followings by wearing their opinions on their sleeve. But blogs don’t have to be biased to gain readership. The Baltimore Sun operates the Maryland Weather blog, which contains forecasts and analysis of the weather in the mid-Atlantic states. Many states have similar weather blogs. Nothing biased about that. Blogs can be used to publish virtually any digital content, whether text, audios, or videos. They need not have any bias or slant, nor do they need to be about politics, news, or opinions. Ask someone where they got their facts, and if they answer, “I read it on a blog,” the response is often a snicker. There is a perception that blogs lack credibility, that they are unedited commentary, often written by ignorant or ill-informed people. However, bloggers have long served as an important check on the accuracy of the mainstream media. In 2004, a blogger at Free Republic challenged a CBS News report that the former U.S. President George W. Bush received preferential treatment during his National Guard service. It turns out that the show, 60 Minutes, was basing that story on forged documents. Under normal circumstances, CBS might not have issued a correction until after the 2004 U.S. presidential election. But the blogs turned up the heat immediately, resulting in Dan Rather resigning his post at 60 Minutes. Blogs are a cheap and democratic media. Almost anyone can start a blog for free and begin publishing his or her opinions immediately. But blogs can also be more rigorously edited than mainstream media. The blogs we produce at SixEstate are reviewed by multiple editors before and after they are published. The result is we produce fewer typos and other errors per story than the largest newspapers in the United States. The truth is that blogs are a new publishing medium capable of breaking original news stories with oversight and editing that can be superior to what the mainstream media produces. Not only can blogs have higher standards of journalism, they are often more fair and impartial than their major media counterparts. And most blogs have an important mechanism for discovering and revealing mistakes: comments by their readers that appear alongside the original story. 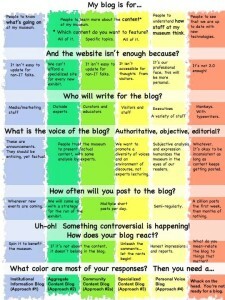 There are many myths about blogs, and few truths. Here’s one: The best blogs have the best content. No matter what shape it takes, there’s no substitute for quality content. Image by Cambodia4kids.org (Beth Kanter), used under its Creative Commons license.